I hope everyone had a great holiday with lots of good eating, drinking, and family time! We had a great time hosting Christmas dinner this year! I am surprised at how busy I have been this past week, but I guess that’s just my nature coupled with all the festivities this time of year. I have a new quilt (my second ever) that I’m working on sewing-wise, a homemade dinosaur sleigh bed that my husband and I are working on craft-wise, and a notepad sitting next to my computer full of notes of topics I want/need to write posts about. I keep telling myself in due time all will come together, and I really do believe it will. But today we must discuss pesto. As I’ve mentioned before, we have multiple food allergies in the house, and dairy is the common allergen all three of us (A.S., A.W., and myself) share. I’ve managed to come up with substitutions for close to all things dairy with my kids, but they have never had pesto. As a matter of fact, I haven’t had pesto in years myself. I have missed it! Pesto with no cheese? Are you kidding me? I am sure that authentic Italians must make some ridiculously delicious pesto, but I only ever seem to see it pre-made at the grocery store. Even if I was able to eat it, I think I’d be hunting for ways to make it fresh and without any preservatives for my family. I had a brainstorm of the perfect combination of ingredients yesterday and put pencil to paper and ingredients to a mixing bowl. The results were amazing! I even had my mom stop by to watch the kids for me, and she ended up trying it. She who can eat blocks of cheese, she likes it that much, and who has no allergies, said she really enjoyed it. Let me stop talking it up and just write the recipe already! This will take you about five to ten minutes to prepare and serves four to six. First brown your pine nuts in a little ghee on stovetop. Get them nicely and evenly toasted, to your desired hue of golden brown. Serve immediately on top of warm, just-made spaghetti noodles. (We use these noodles at our house.) Sprinkle extra cheese on top, if you’d like. 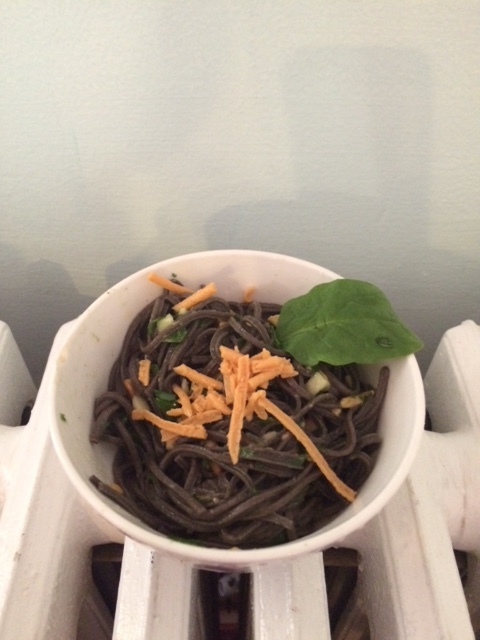 The black bean spaghetti noodles we use don’t necessarily look appetizing, but, I promise, they are tasty! And, of course, you know that I’m going to say that I can’t see a reason why you couldn’t try the full-on dairy version of this recipe with regular butter and cheese. I would if I could! I think I’ll make this again for lunch today! < Previous Wishing You a Merry Christmas!